13 Questions is a weekly series where we ask chefs 13 questions to get to know them outside of the kitchen. 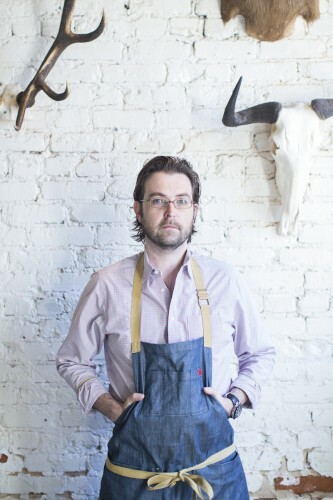 Robert Phalen is the executive chef of One Eared Stag. Sushi rice—you can really mess it up. I’ve tried before, poorly. What do you do when you aren’t cooking? I read cookbooks. Hugh Acheson’s book is great . . . If I buy a new cookbook and I can get one piece of inspiration from it, then it’s worthwhile to purchase it—even if it’s just a photo, just to see someone else’s plating. I also hang out with my three kids. They’re six, five, and two. We play a lot of games and Legos. Frozen Home Run Inn pizza. I’m from Chicago, and it’s thin crust but really great. You can get it here; I found it here a year or two ago, and it completely blew me away. Charleston. We lived there for three years [when Phalen was at culinary school at Johnson & Wales]. There’s just so much history, and we still have ton of friends that live there. We love the beach, too. I want to move back because everything’s slower, and it’s beautiful downtown. You attended culinary school. Was it worth it? It’s really what you make out of it. I went to college first [at Ole Miss] and had worked in restaurants, so I already knew how to cook. I was a dish washer at a pizza place; it was a job just to pay my rent. Basically when I left there [after two years], I was running the kitchen. But I wanted to know the reasoning of why you cooked the way you did, so yeah, culinary school is worth it. If you weren’t cooking, what would you be doing? I’d like to think of myself as a Major League Baseball player. I played growing up, right field. I was the kid that put the glove up and hoped to catch it, but I was devoted. What was the biggest challenge of moving restaurants from East Atlanta Village to Inman Park? My biggest challenge was being in East Atlanta Village because I was cooking food I really didn’t understand. When we opened up Holy Taco, I thought it would be the easiest thing, but to make good tacos is not easy. The Spanish cuisine is very complex; you’re building all these flavors, and it’s time consuming to find something that works and is constantly good. And I didn’t go out in that neighborhood, so I didn’t really know the clientele . . . Moving to Inman Park is more of my style: It’s slower. People are more apt to be friendlier. It’s calmer because there’s not the late-night ruckus. It’s more family-friendly. What do your kids ask you to cook for them the most? They like takeout Chinese food. We order from Chin Chin. Other than your own, who makes the best fried chicken in Atlanta? Chik-fil-A, it’s pretty good. We don’t go out that much, and if I go out, I am not getting fried chicken. Does it bother you when people come into the restaurant and only order the meatstick? It used to, and now I am kind of really embracing it. The whole thing came on a joke. Green Olive Media said, “You should make a burger,” and my whole stance was I’ll never make a burger. So they came in for one of the meetings, and I served it and said I am calling it the meatstick. It’s a Phish song that was never released; they only play it live. So the meatstick is never on our menu; it’s only live. It allows anybody to come in here and not spend a ton of money and enjoy the atmosphere. You’re a big Phish fan. How many times have you seen them live? 287. When you’re in college, you’re able to go to a lot shows. I’ve been a fan since 1993, so it’s 20 to 30 shows a year. This year, we went to six. Why Schlitz with the Chef’s Breakfast?